« B014 Daleks’ Invasion Earth 2150 A.D. 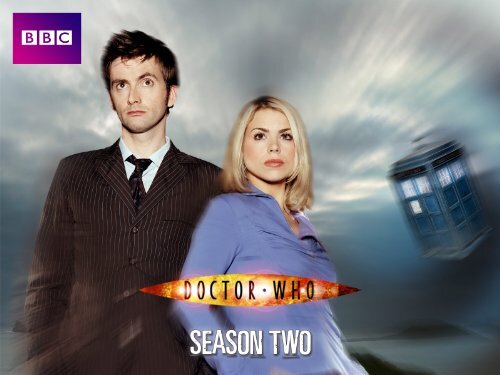 The Doctor and Rose take Mickey on his first trip through space and time to a 51st-century spaceship, where Mickey promptly pulls Rose off-screen, so that Doc can go have his own adventure. After encountering an 18th century fireplace aboard the ship, and finding that it’s only one of several portals to different periods in the life of one Reinette Poisson (actually Jeanne Antoinette Poisson, also known as Mme de Pompadour), things are looking pretty trippy, but it’s not until The Doctor finds that sinister Clockwork Droids are surveilling her development through time that stuff gets really nasty. The spaceship has human parts fused into its circuitry, Rose and Mickey are about to be stripped for parts, and on top of all that there’s a horse aboard the ship! getting more confident. The production values are fantastic. In short: this is perfect. Great acting. Great story. Great music. One of the best episodes, if not the best. I really love this episode. Pre-face: This is the first episode of Doctor Who I ever saw, sitting bored flicking through channels one day as a kid. And in one short episode, Steven Mofffat showed me everything great Doctor Who could be, and so began my love of all things Who! The fairy-tale aspect that Moffat would embrace in series 5 comes almost fully-formed in this episode. The contrast of the dingy spaceship giving way to Versailles, as Renitte sees ‘The Fireplace-man’ fight off the monsters that hide under her bed is pure fairy-tale, and it’s brilliant. Reinette is at the heart of this episode, she’s the Macguffin for the sinister clockwork droids, but is characterised as strong-willed, adventurous, and wise beyond her years as she takes in her stride all the revelations of her meddled life. Sophia Myles breaths life into the character, and is honestly superb, one of the best supporting actors in Who, with great chemistry with Tennant. The dialogue is superbly written (I mean what else do you expect from Steven Moffat? ), and there are some brilliant character moments. The drunk Doctor, Rose and Mickey’s back-and-forth, and of course Arthur the horse. No matter your opinions on the Doctor as a romantic figure, his relationship with Reinette is magical, and makes it all the more painful when we learn of her death, awaiting the return of her ‘lonely god’. The idea will be repeated with Amy Pond and the Eleventh Doctor in a non-romantic way but I find it so much more powerful here. Maybe it’s the actors, the pace of the episode, the music, or just a mix of everything. As Ten reads the letter from Reinette, and we hear her final words, we get the following shot of the TARDIS de-materialising, explaining the last plot point of the episode, why the robots chose Madam de Pompadour in the first place. The writing is so taught, so perfect in it’s union of sci-fi, fairly tale, horror, comedy, and tragedy. As with most of Moffat’s story, it’s human to the core, just like the SS Madam de Pompadour itself, and I love his stories for it. This isn’t just good Doctor Who, nor just good sci-fi, it’s something so much more. The Girl in the Fireplace gets a 5.0 from me. I wanted to try and make sure I got this review for The Girl in the Fireplace because it goes back to something I’d mentioned in a prior review. This episode is also a favorite of my younger nieces, who I also mentioned in the Eccleston reviews. Admittedly it’s mostly for the jokes with the horse. I’ve always enjoyed Moffat’s ability to make seemingly innocuous things (in this case a ticking clock) and turn them horrifying. I also always enjoy watching a companion’s first TARDIS adventure. Especially when an already experienced companion is there, too. Rose gets to be the voice of experience, showing Mickey the ropes of traveling with the Doctor while Mickey gets his mind blown all the new wonders around him. My single biggest problem with the episode is the end. Even if there was no way to include Rinette as a companion, much as the Doctor would’ve liked it, using the fireplace instead of the TARDIS to collect her just seems a very boneheaded move. He justifies not using it during the crisis because they’re part of events, but it seems once the crisis is over they should be fine. It’s not like he didn’t know where to go and, going by the rules Moffat’s since established, once Doctor found her dead and read her final letter, everything was locked in place. A simple trip in the TARDIS could have avoided that. The only thing I can think of is that it was already too late the instant the Doctor left in the fireplace. Despite that, the episode was a very good one to me. I give it a 4.4. *The First Law of Robotics is that a robot may not injure a human being or, through inaction, allow a human being to come to harm. This episode’s quality lies in its construction; it starts off above average but builds almost perfectly to a sentimental crescendo. That we feel we see the entirety of Mme du Pompadour’s life within 45 minutes is a credit to Moffat’s writing and plotting. But though Tennant never stops talking, Mme never gets the eloquent speech she deserves. Her vaunted intelligence, save her reading Doc’s mind and a très formidable scene with Billie Piper, is almost entirely reportage or just the type of formal language you’d find in a nineteenth-century novel. Maybe when she’s being a bimbette with her crony in the garden that’s supposed to indicate her mastery of sociolects? Why not show her taking down Voltaire? Rose is thankfully much gentler than she has been in a while. Mickey’s great again: ‘Even French!’ Whimper! The baddies are never particularly scary (although their clockwork looks marvellous), the horse through the fireplace, while cool, doesn’t make perfect sense, and the final reveal of the SS Mme du Pompadour seems entirely ridiculous. Even if you compare it with the USS Teddy Roosevelt. –0.1 more for a gratuitous ‘Doctor Who’. Show Notes: 1) True trivia: the rotating fireplaces trope was invented by notorious oligarch author Archibald Truelove to entice children into burning themselves to death for the purpose of population control. 2) Real fact: By order of Louis XV, every day in 1747 actually was Carnevale. 3) Genuine titbit: in the original script draft the spaceship was the HMS Camilla Parker-Bowles.